This spring, Molly and Marwan will be touring physically and by video link to meet readers of Brothers of the Gun, the book they created together that One World/Penguin Random House will publish on May 15. Brooklyn Public Library will host a conversation with Molly (in-person) and Marwan (joining by video link), and Sinan Antoon. 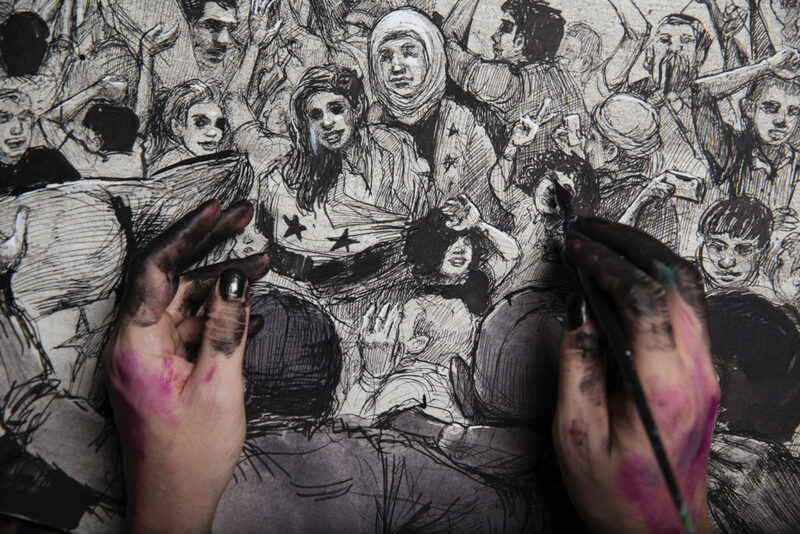 There will also be an accompanying art exhibition, Syria in Ink, opening that night. Free, with reservations requested. Later this day Molly will talk at the Last Bookstore with Los Angeles Times journalist Matt Pearce at 7:30pm (seats can be reserved). Molly will appear in person for a conversation with Marwan, joining by video link, at the Bindery, the Booksmith’s new event space, at 7:30pm. Molly will be in conversation with Lidia Yuknavitch, author of The Book of Joan and The Misfit’s Manifesto, at Powell’s (main location), at 7:30pm. Powell’s City of Books – 1005 W Burnside St. Portland, OR. Molly will appear in person for a conversation with Marwan, joining by video link, at Elliott Bay Book Company, at 7:00pm. Molly will be in conversation with Alexis Okeowo, winner of the PEN Open Book Award, at the Strand, as part of PEN’s Out Loud event series, at 7:00pm (admission details are here). Molly will be in conversation with Latoya Peterson at East City Bookshop, at 6:30pm and reservations are requested. Molly will appear in person for a conversation with Marwan, joining by video link, and Paul Mason at the Human Rights Action Center at 18:30. Molly will appear in person for a conversation with Adam Biles. Marwan will be joining by video link at Shakespeare and Co. at 7:00 pm. Molly will appear in conversation with Jonathan Guyer at Harvard Book Store at 7:00 pm. Bookstores hosting events will have specially signed bookplates by Marwan (limited quantities, while they last), and Molly will be signing copies as well–– to order a signed copy, contact the bookstore directly before the event. This entry was posted in Uncategorized on April 25, 2018 by AC.